Earth rotates on its axis at a rate of about one revolution every 24 hours or so, and so celestial objects appear to move across the sky in an arc as the Earth turns. The Equatorial Mount permits one to move a telescope in the opposite direction from that which the Earth is rotating, and with a drive it can move at the same apparent speed as that of the Celestial objects. But this only works well if the axis of rotation of the mount is parallel to that of the Earth. Astronomers used to install a telescope onto a mount, then use the telescope to help align the Right Ascension axis of the mount to the Celestial Pole. Fortunately for those in the Northern Hemisphere, we have a bright star "Polaris" within a degree or less of the North Celestial Pole (or N.C.P.) and so we can use that star to help start the process of alignment. More discriminating users employed techniques (Drift, etc.) to refine the alignment further and further. 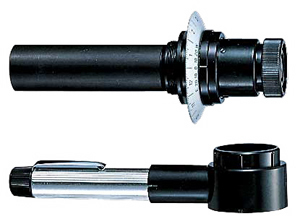 By the 1980's telescopes appeared on the market which employed Pole Finders, a separate small telescope mounted coaxially to the main telescope of about 7x or 8x 50 mm with a circular reticle pattern etched in the eyepiece. While a notable step forward, these finders could be imprecise. It was determined the best way to assure a good Pole Alignment was to incorporate a small telescope into the mount itself. 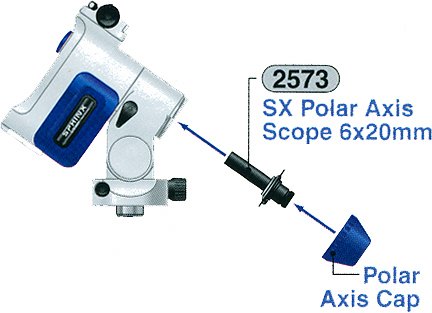 By providing a perforation in the Counterweight Shaft or Declination Axis shaft, one could install the Pole Finder in the Right Ascension axis, align this finder to the mount fairly easily, then rotate the telescope so that the hole in the perforated shaft permits a clear line of sight to the celestial pole. The Vixen Pole Finders incorporate an analog dial scale where the local date, time, and latitude can be factored in during initial set up. The Finder incorporates a small etched star chart of the areas around the North and South Poles that are visible at night in the eyepiece of the Finder with the aid of an illuminator. The Chart incorporates reference marks so that by aligning the Equatorial Mount so that the reference stars in the chart correspond to those in the night sky an accurate alignment can be made. Vixen has engineered all their German equatorial mounts to accept an optional Pole Alignment Finder. 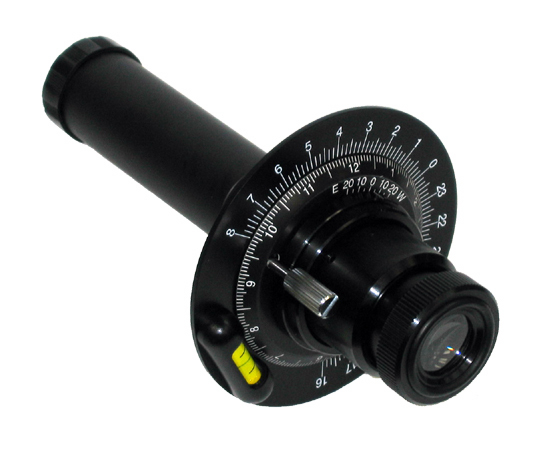 With this accessory obtain good enough alignment so that you can walk away from the telescope and come back later to find the telescope still on the target. And it is easier to start into astrophotography; we have numerous photos on Company Seven's showroom walls taken by our customers with this equipment. arrangement of most Pole Finders on German Mounts (40,181 bytes). Threads into port on Right Ascension Axis. Useful in North and South Hemispheres and facilitates Pole alignment can be accurate to within 3 minutes. An adjustable brightness Reticle Illuminator is provided (two "AA" batteries required). Right: Vixen Pole Finder, with Illuminator below (31,621 bytes). Threads into port on Right Ascension Axis, the barrel and threading are similar to that of the GP Pole Finder shown above. Useful in North and South Hemispheres and facilitates Pole alignment can be accurate to within 3 minutes. Unlike the model for the GP mounts the SX mounts incorporate an adjustable brightness illuminator for use with the Pole Finder, and so no separate illuminator is necessary. The SX Pole Finder telescope inner dial (indicating the 12 months) is provided with a chromed metric thumbscrew to lock the dial in place as shown in the image at right. Right: Vixen SX Pole Finder (18,242 bytes).